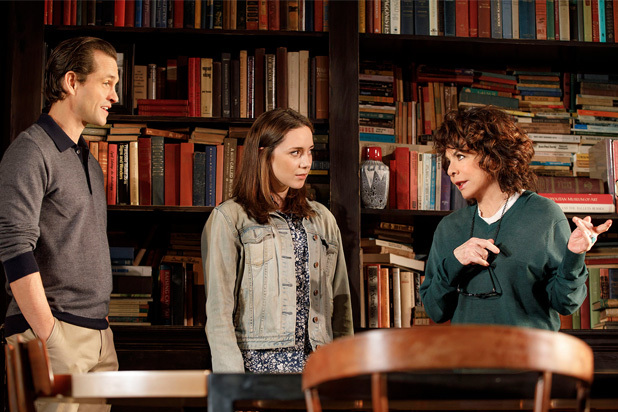 December 12, 2018: Sunday is the last chance to catch the marvelous Stockard Channing, in peak form, turning in one of the finest performances of this or any season in Apologia, a new drama by Alexi Kaye Campbell making its New York premiere at Roundabout’s Laura Pels Theater. At the matinee on Sunday, the star will take her final bow as Kristin Miller, a 1960s political activist and protester, now a celebrated historian. Playing a role, she originated in London last year, Channing is simply unforgettable. She delivers a beautifully layered portrayal of the mature woman facing the consequences of her past, not long after the publication of her memoir. The play, directed by Daniel Aukin, opens at Kristin’s English country home in 2009, where she is about to celebrate her birthday with her two sons. Her recently published memoir, which doesn’t mention the two men, clouds over the birthday festivities, opening old wounds and threatening to tear the family apart. 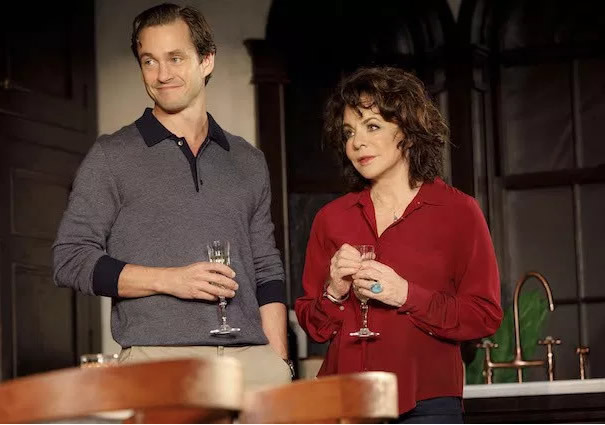 Despite his attempts to cover his feelings, Peter, Kristin’s older son played by Hugh Dancy, is obviously annoyed at not being mentioned in his mother’s memoir. He is a banker and he has brought with him his American girlfriend, a devout Christian named Trudi, played by Talene Monahon. All sorts of emotions flicker and boil-over as the three try to make polite conversation, but tensions are running high, and Kristin does not suffer fools lightly. She tries to explain that her memoir was not a look at her life, but her career, and that’s why those details are not mentioned. Late in the first act, after Peter and Trudi have gone to bed, Simon, Peter’s troubled brother, played by Dancy again in a dual role, shows up with a bleeding hand and a guilt trip for his mother. But you don’t mess with Kristin Miller! Campbell has set the table for a caustic struggle between the young and the not so young in her compelling family drama that is also a lively look at yesterday’s rebels. The play looks at the costs and sacrifices women make to open doors for others by forging new beginnings in fields and areas where they have never been allowed. If Kristin has become a bit of a monster, perhaps she had little choice. Celebrity makes semi-monsters of even the best of us. Men, however, wear that station with more ease and comfort than women. For women breaking the glass ceiling is still a challenge, an ongoing struggle. At the center of the play Ms. Channing is majestic as Kristin in a complex and nuanced performance that will keep you thinking about the evening long after it has ended. Oct. 16—Dec. 16. Roundabout Theatre Theatre Company at Laura Pels Theater/Harold and Miriam Sternberg Center for Theatre, 111 W. 46th St., NYC. Tue 7:30pm, Wed 2pm & 7:30pm, Thu—Fri 7:30pm, Sat, 2pm & 7:30pm, Sun 3pm. Running time: two hours and 15 mins. including intermission. $99. (212) 719-1300. www.roundabouttheatre.org.